Mick Fanning and Kelly Slater. Not a poor picking of pros to spot at your local break. But for Gold Coast native Kelvin Mill, these surfing black swans might very well be the most inspired lot yet. According to a report by Nine News, last December, Mills captured these birdies catching some serious waves at Kirra. 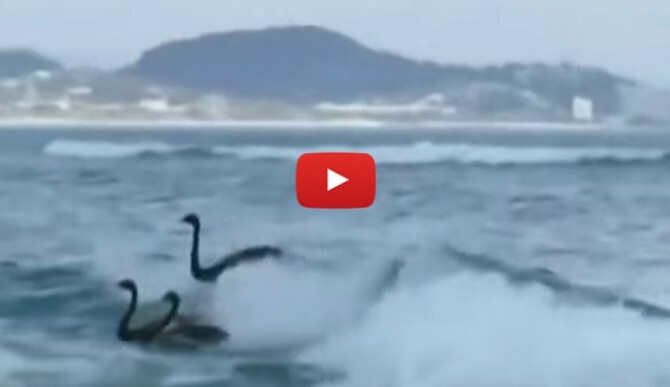 He told the interviewer that he had never before seen black swans at the beach, let alone surfing — but these swans knew what they were doing: after one caught the first wave, it flew back out where it was joined by its fellow flyers for a party wave. While this is definitely a little older, with the seasons changing, it felt appropriate to get us all in the shifting spirit. Noticing the crowd was picking up, they took off, likely searching for empty lineups far away from those kooks wearing wetsuits and riding boards.